Editor's Note: The following is a legacy piece first published in Spring 2012 at 5550opinions. 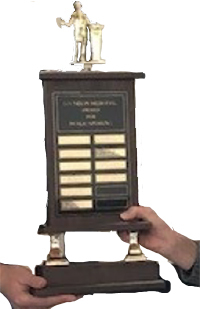 Sometime around now, a committee is about to meet within Rotary to decide whom to nominate as the 2014-15 President. 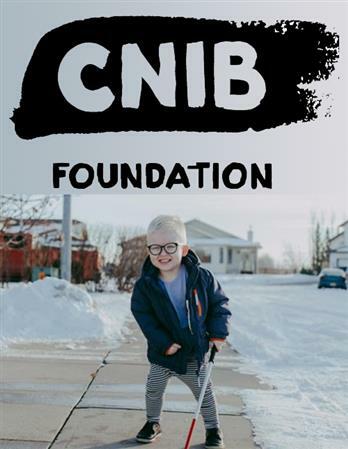 Being an advocate for the Canadian National Institute for the Blind (CNIB) began seventeen years ago for Wendy Wiedenhoeft when her grandson was born blind. 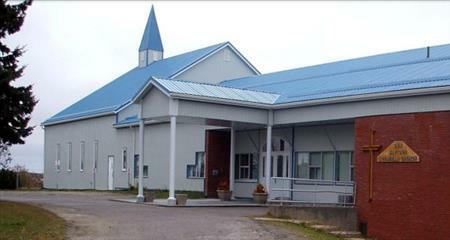 Today, Wendy is Northwestern Ontario’s representative on the CNIB Board. Dryden’s economic wows have been front and centre for so long that it was a delight to hear the optimism in Tyler Peacock’s upbeat presentation on Dryden’s future. Each week the editor of the club’s weekly KEYWAY newsletter includes a column titled “The lighter side” in which items of a humorous nature appear. 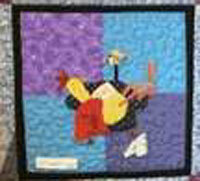 The item this week took the form of three pictures under the banner in the title. Chance Meeting with Former Roommate’s Brother Leads to Life in Dryden. Terry McKay recently joined Rotary and shared her life story with club members. 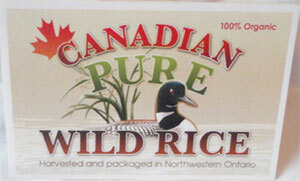 Terry was born in Tillsonburg, Ontario but grew up in Orillia, on the shores of Lake Couchiching. Member of Parliament Robert Nault visited Dryden Rotary to give us an update on the work he is doing on behalf of the Kenora Riding in Ottawa. When a new member joins a Rotary Club, they eventually have to give a little speech on their life story, especially their work history. We call it a “Vocational talk”. This is Graham Harrison’s story. 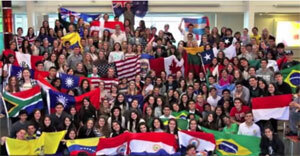 A compendium of Rotary Clubs in the news for February 26, 2019. Yesterday and today are tests to gauge the response to a daily news feed. It will take more time to establish the system to generate posts of this nature. Based on the response to the February 25, 2019 post it appears feasible to continue such a project. Melissa Munn, the coordinator of the Community Action Program for Children (CAP-C) of the Métis Nation Ontario (MNO), described the services they offer out of their office at 34 King Street. 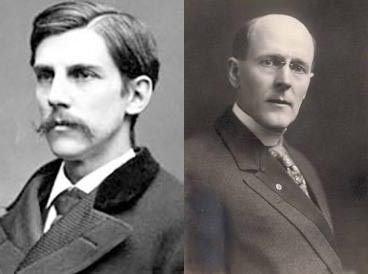 Oliver Wendell Holmes Jr., the esteemed Justice of the Supreme Court of the United States from 1902 to 1932, left many opinions which guided the creation of civil society in America for much of the Twentieth Century. 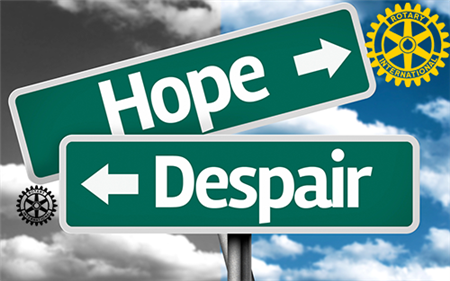 To Hope or Despair, that is the Question? I am proud to say I am an American because I have the good fortune to live in a country that listens and reports – it provides a journalistic communication mechanism which gives prominence to controversial personalities and their radical ideas. At the end of the day, when the disillusion with the status quo reaches a critical point, incredible change happens through the ballot box, and new ideas are put to the test for at least four years. At the individual level, the process can be so disruptive and painful that many want only that it will end. The first view offers hope; the latter only leads to despair. I am a Japanese businessman, and I wear a suit almost every day. The Rotary pin is always on my lapel. 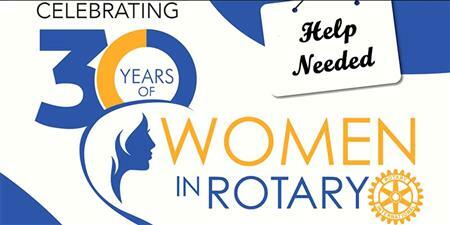 It is there because I am proud to be a Rotarian. Anywhere I go, people will see the pin and know who I am. 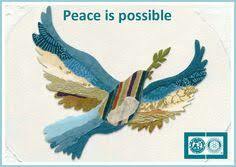 Other Rotarians will see it and know that I am a friend, and people who are not Rotarians will see it as well. I want to be sure that all of them also understand the meaning of this pin. Gone are the days when all Rotary Clubs met weekly over a meal and attendance was taken and tracked. Over the past decade, flexibility and innovation have become the mantra of Rotary International. And the grassroots have taken up the challenge of creating new ways for clubs to meet the demands of modern society and different cultures. AOC, AOC, AOC: it’s a chant frequently heard throughout the United States since the November mid-term election. For those not of the USA, who do not follow American politics, AOC stands for Alexandria Ocasio-Cortez. 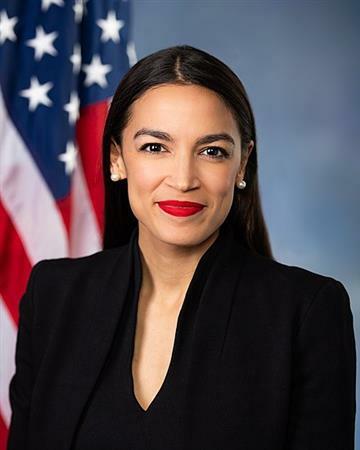 On January 3, 2019, she became the U.S. Representative for New York's 14th congressional district and at the age of 29, the youngest woman ever to serve in the United States Congress. Cole Ford and Ashley Armit, two students from Dryden High School, attended the 2018 Rotary Adventures in Agriculture Program in Regina organised by the Rotary Club of Regina Eastview from November 21st - 25th, 2018. 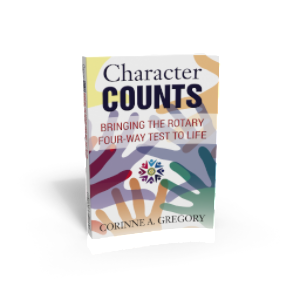 Corrine Gregory and Wallis Zbitnew, two North American Rotarians have both written books on Rotary’s take on the golden rule. 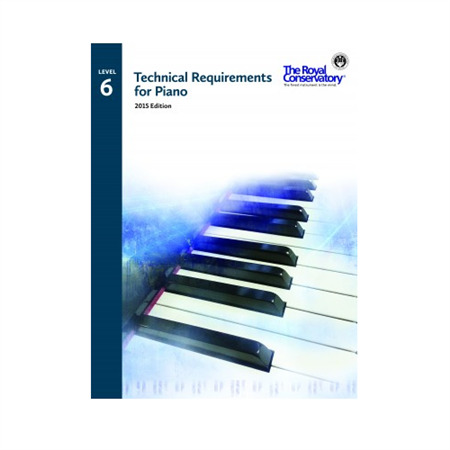 While the authors bring a different approach to the task of reflecting on how the “Test” can be used in life and work, they have the same goal to use it as a means to develop a more ethical and civilised society. 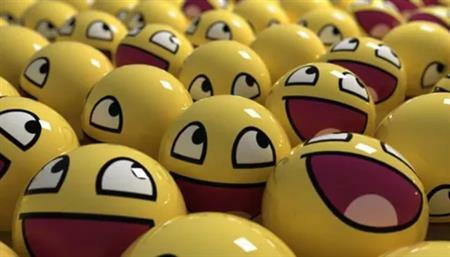 Are Rotarians happier and healthier than most people in society? Although I could find no article which definitively answers that question, there is plenty of evidence from research that volunteering in a community through an organisation makes you happy with the result that you are more likely to be healthier as well. It is especially true if the benefits that accrue are to your community. 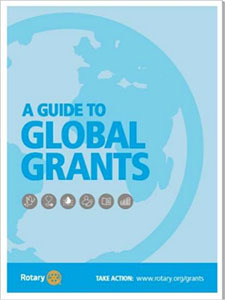 Are Global Grants Distorting the Heart of Rotary? The heart of Rotary is the service club and the community in which it exists. People join first and foremost because they want to give back to their community. Finding fellowship and honing leadership skills are pleasant extras. 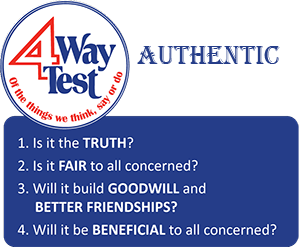 At a recent meeting, the Wilmington Rotary Club invited Wilmington College Philosophy Professor Ron Rembert to share his view of Rotary’s Four-Way Test as a philosopher. Dr Pat Love speaking to the Rotary Club of Pagosa Springs, Colorado asked Rotarians to identify a malady which is more highly correlated with early morbidity than obesity, smoking and drug abuse and is also correlated with violence, careless acts and substance abuse. 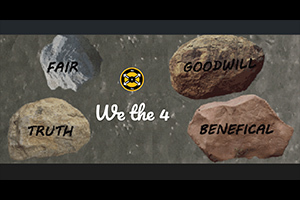 We the 4 is a blog on Rotary International, its clubs, districts, and Rotarians. 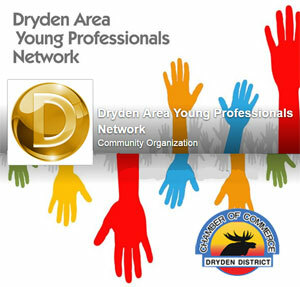 It is a component of the Rotary Club of Dryden’s website where Rotarians can express opinions or information pieces on Rotary issues or experiences. 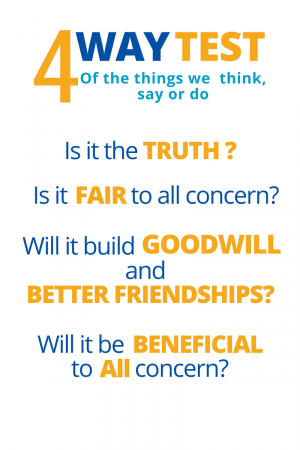 Opinions expressed on The Rotary Club of Dryden’s blog Wethe4 are those of the author or authors of the piece. The Rotary Club of Dryden takes no responsibility if any reader misinterprets the opinion of the author or authors to be that of Rotary International, its Zones, Districts or Clubs. Do you know what a brownfield is? The Merriman Webster dictionary defines it as “a tract of land that has been developed for industrial purposes, polluted, and then abandoned..” Cambridge English lumps together “interstitial spaces, brownfields, disused industrial estate, railway lines and stations, abandoned ports, and plots in ruins as unproductive areas within the economic structure of the city which could potentially be used for temporary activities. 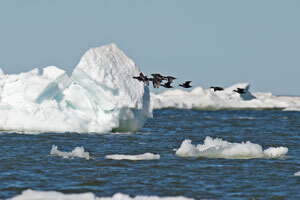 The issue of climate change and the melting of the polar caps is everywhere at this moment in history. 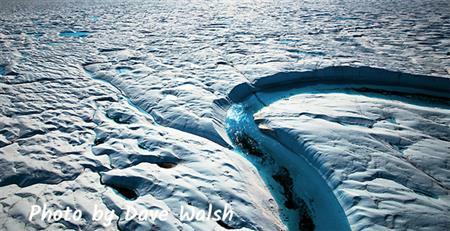 However, according to one former Rotary International director Rotary has its ice cap. Rather than being found at either end of Rotary’s linear structure, it is according to the director found in the middle of its structure or to use a quote from a comment on FaceBook the “Frozen middle”. In the book All Our Relations: Finding the Path Forward, Tanya Talaga, explores the alarming rise of youth suicide in Indigenous communities in Canada, with a special emphasis on North Western Ontario. Part of that story is grounded in the abysmal history of Indigenous education from the late 19th C, through the 20th C until today. 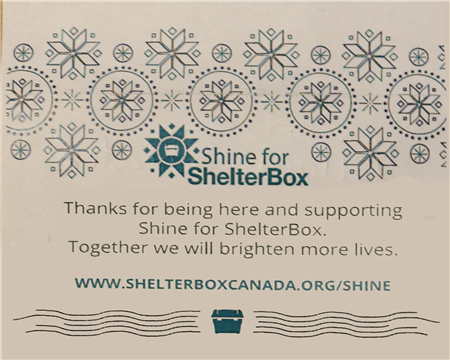 Seventy patrons from Dryden and North Western Ontario, attended a Shine for ShelterBox fundraiser at The Centre on the evening of January 30, 2019. ShelterBox is an emergency disaster relief agency which provides emergency shelter and tools for families robbed of their homes by disaster or conflict. 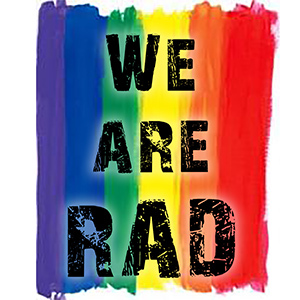 Representatives Amanda Nisula and Meghan Winters of the Rainbow Alliance Dryden (RAD) spoke on how they support Dryden and area’s LGBTQ2S+ community. Preparation has begun at the Dryden Rotary Club for the 2019 rendition of our Online Rotary Auction. Dryden hunter and entrepreneur, Marc Mcnay, owner of the Real Deal shared the story of his rise to prominence as a promoter of wildlife hunting. 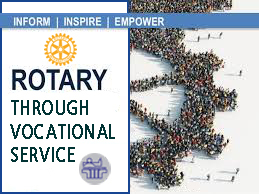 Each year, no doubt at significant expense, Rotary creates a Presidential Theme and a logo to accompany it. Most, thank goodness, are immediately forgettable. 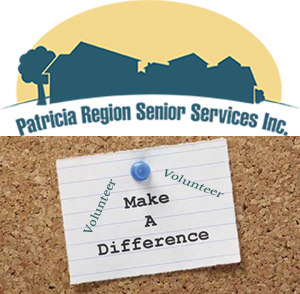 “We are getting older and will eventually need many of the services provided by Patricia Region Senior Services Inc.” Joy Auren, the new Volunteer and Community Engagement Planner at Patricia Gardens, told Dryden Rotarians at their meeting on Wednesday. As we approach the mid-point of this Rotary year, it is time to reflect on the achievements and activities our club has been part of, both locally and areas farther afield. It seems like an eternity since our annual fish fry at the Flying Club when Past-President Ed and his Executive turned over the mantle of responsibility to the incoming group. “Why Horses?” is the most frequent question Joyce and Meagan Gardner get asked when they describe what they do at Horseshoe Connections, an Equine-Assisted Learning Ranch. This year two very confident young women from St. Joseph School tied for First Place in the Dryden Rotary Ian Nixon Memorial Public Speaking Contest. 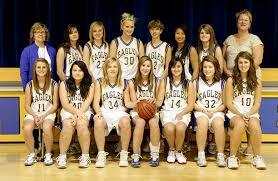 They are Kaitlin Viherjoki and Kira Graver. Both girls are in Grade 8.
Who knew! 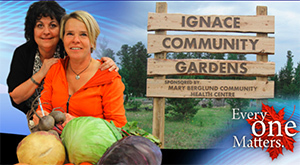 The Mary Berglund Health Centre’s (MBHC) Community Garden has grown to include animals and redubbed McRotary’s Farm in honour of our club's support of its gardens and health project. Ted Mitchell, a Dryden High School Teacher, and a member of the Oxdrift Legion ask Rotarians to “try to remember or imagine the world of a military person during war”. Graham MacKenzie, the recently appointed Manager of the region’s sole tourism marketing association, the Patricia Region Tourist Council (PRTC) spoke to Dryden Rotary on the current state of the organisation. 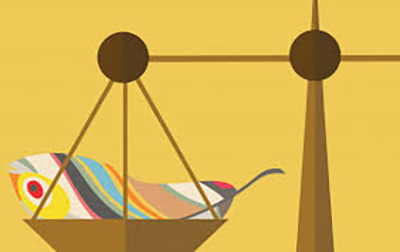 The research is clear that a hungry child is at a clear disadvantage compared to a well feed child when it comes to school-based learning. Hence many jurisdictions have a breakfast program. There are a few children, however, whose level of food security is such that they may not be getting enough food at home on the weekends. Rtn. Cynthia Palermo and student Samantha Meek, one of two DHS students, spoke to the club about the Rotary Adventures in Human Rights program they attended in the summer of 2018. Payton Zilkans also attended, however, was not available for the presentation. 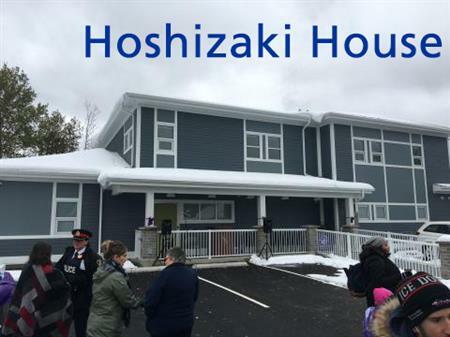 The Dryden Rotary Club is helping the reopened Hoshizaki House to furnish its new building. Dryden Rotary 2018 Awards Night a celebration of our best Young Piano Students, Outstanding Community Volunteers and Club’s Paul Harris Fellows. 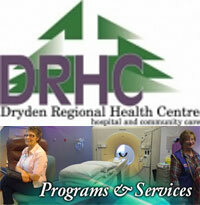 Each year The Rotary Club of Dryden holds a special awards evening. The event occurs at The Centre with a dinner after which we move to the venues performance seats for the awards ceremony. 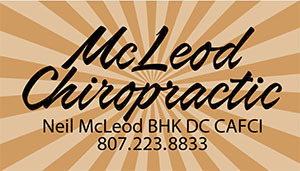 Neil McLeod, Northwestern Ontario born shared his vocational journey to becoming a chiropractor. Dressed in her souvenier studded red blazer former DHS student Lindsay Cole shared highlights of her year in Belgium with Dryden Rotary. 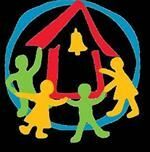 Terry Ollerhead of Dryden’s Lutheran Parish provided a brief update on their work in Haiti. 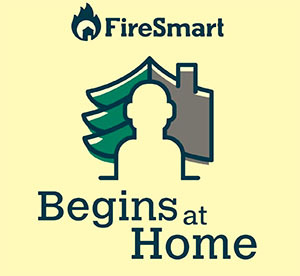 Malcolm Robertson, a local MNR officer, spoke on FireSmart a program about living with and managing for wildfire on our landscape and property. Here is what happened when District Governor Elaine Thompson, met Elaine Thompson Rotarian extraordinaire of the Rotary Club of Dryden. District Governor for 2018-19 starts her tour of clubs with Dryden. The 2018-2019 District Governor Elaine Thompson visited the Dryden club on July 4th. Elaine and her husband Ed, a former Past District Governor, were travelling home to Winnipeg by RV after visiting the Rotary International Convention which was in Toronto from June 23- 27th. 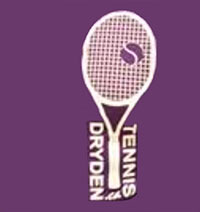 Humberto Pacheco, speaking on behalf of Brian Eschbach President of the Dryden Tennis Club described how Dryden lacks the facilities of other local communities such as Kenora or Sioux Lookout. This lack of courts prevents DTC from holding local tournaments and improving our young players. Maryn Wrolstad, Dryden’s out-going Exchange Student, will spend the 2018-19 school year, in Chelles, France. Chelles, France is in Rotary District 1770 just outside of Paris. New Executive Installed for the 2018-2019 Rotary Year. 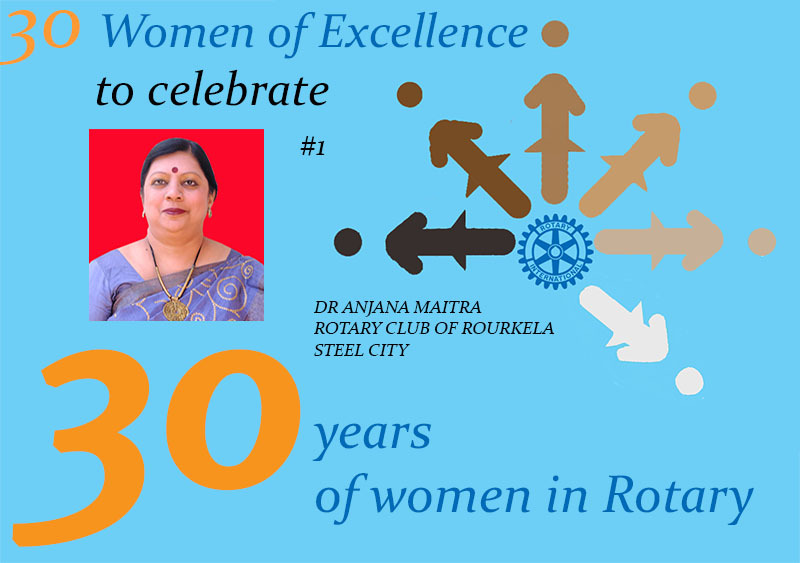 The Rotary year extends from July 1 to June 30th. As a result, a new executive is sworn in during the last meeting in June. Sipos earns Dryden Club Zone award for her work with H4H. Club member Sally Sipos who has been on 14 builds with Habitat for Humanity, shared her May 2018, experience in Macedonia with the Club. In response to a spike in impaired driving arrests two years ago, Sergeant Michelle Teeple began to fight back galvanizing leaders and agencies in our community to form a group to tackle the issue of impaired driving. One of the customs of a Rotary Club is for a new member to give a talk on their vocation. Such short speeches have become known as a “vocational talk”. Although members are expected to focus on their “work,” there is a large autobiographical component to most talks. Bob Macdonald and Donna Pollock gave their talks at the April 11th meeting. Bill Reid, a KPDSB teacher and leader of the Hockey Canada Dryden Skills Academy shared the history and goals of the program. 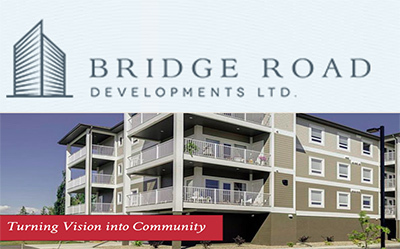 Harry Funk, Capital Coordinator, for Bridge Roads Development (BRD) described the progress he and his company are making to bring Dryden its first new seniors housing development in over thirty-five years. During the past year, Dryden born and bred resident Kendra Saville accepted an invitation from Rotarian Susan Reany-Iskra, a co-worker at the Dryden Fire Management Centre, to attend the Rotary-sponsored Mudmen concert. At its March 1st, meeting The Rotary Club of Dryden members approved the giving out of $53,480 to various projects in the communities of Northwestern Ontario. 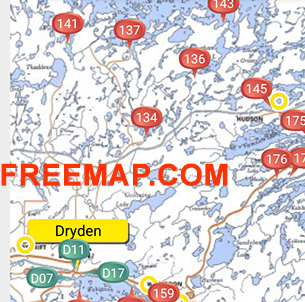 Cynthia was born in Dryden, the oldest of two girls of Brian & Fatima Davidson. Being raised in a family with a stay at home Mom, she learned the importance of saving at an early age. During her 20 seasons dealing with forest fire emergencies, Kendra Saville (left) witnessed first hand the devastation, turmoil and upheaval caused by wildfires across Canada. Jack Harrison, the forestlands manager at Domtar, gave us an update on the woodlands component of Dryden’s pulp mill. 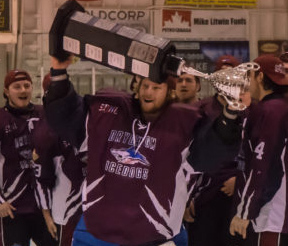 Mike Sveinson, a former Rotarian provided a brief background on the Ice Dogs Hockey Club and the upcoming Dudley Hewitt Cup. Dryden Rotary’s online auction will take place in 2018 from April 10th to 17th. Rotarian and Past Club president, Brian Braid will chair the 2018 fundraising event. The ‘New Year,’ wasn’t the only reason Dryden Rotarians had to celebrate, as 2018 began. January 2018 will stand out in the history of the Club, as the year it reached parity between men and women. 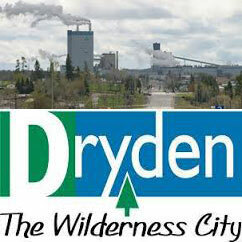 Another story of a Rotarian from “Away”, takes a short-term job in Dryden and then stays. That’s a common theme of many residents of this town and it’s part of LeeAnne Benson’s vocational story too. 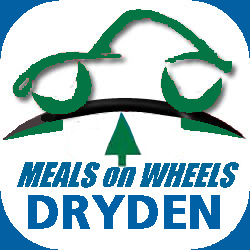 For the past decade, Dryden Rotarians have been delivering Meals on Wheels on weekends as a service to the community. Louise Fisher of Dryden’s Lutheran Church shared with Dryden Rotarians a new program the church is about to start for the caregivers of people with dementia. 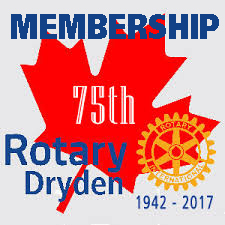 The Rotary Club of Dryden has seen excellent growth in both the number of pages viewed and the number of visitors during 2017. Executive Director Terri Fedorchuk, brought us an update on the changes taking place at Dryden’s crisis shelter for abused women and their children. 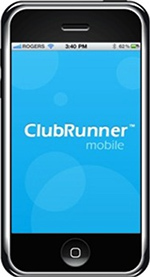 ClubRunner, the platform on which DrydenRotary.org runs, has announced that the ClubRunner Mobile App is available for download! 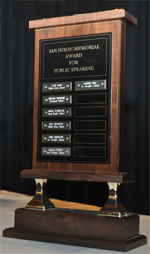 Each year Dryden Rotary sponsors a public speaking contest. 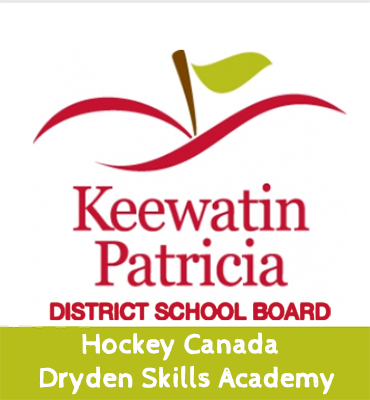 Each school in the Dryden area from both the Keewatin-Patricia DSB and the Northwest CDSB participate. 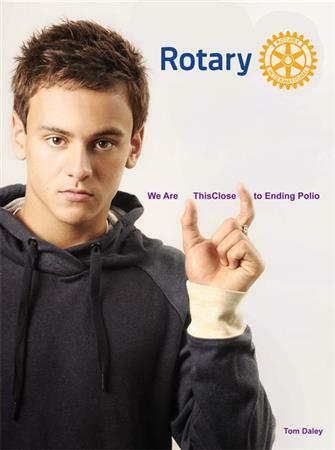 Rotarians act as the judges. With Remembrance Day 2017 approaching, club Rotarians shared their family connections to our past and current military. Each year, The Rotary Club of The Pas organizes a trip to Churchill Manitoba for Rotary Youth Exchange students to see polar bears in the wild. 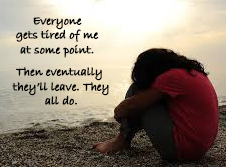 But this year has been exceptionally hard. 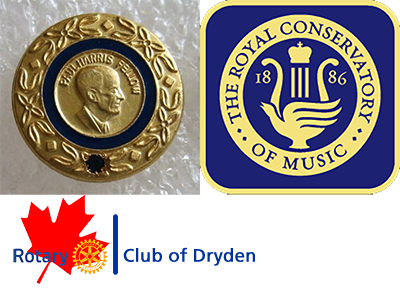 As has become customary at the Paul Harris Fellowship evening, the winning students of the annual Dryden Royal Conservatory piano competition and sponsored by Dryden Rotary, played their winning numbers for members of the club. 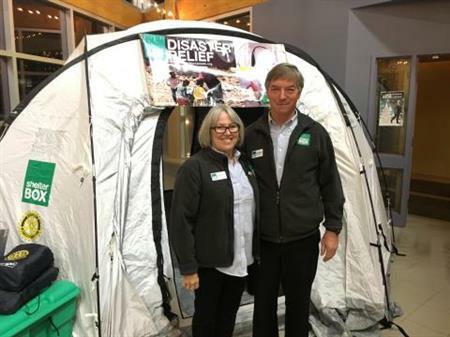 ShelterBox, a supplier of crisis shelter tents, and an official partner of Rotary International is richer by 2 ShelterBoxes after Dryden Rotary’s concert staring The Mudmen, a Celtic rock band featuring none other than two bagpipers. 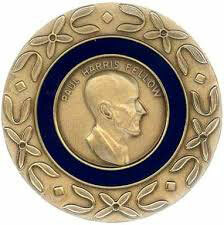 Among the highest tribute, Rotarians can pay a non-Rotarian resident of a community is with a Paul Harris Fellowship. At its meeting on October 25th, Dryden Rotary honoured Willene Moffat and Jim Shearer. The award honours those who exemplify the Rotarian motto “Service Above Self”. On the evening of October 25th six of our Rotarians Jeannie McMaster, Patricia Rigey, Patricia Vann, Pam Brown, Clare Thompson, & John Carlucci, were also awarded Paul Harris Fellowships having contributed $1000 to The Rotary Foundation. 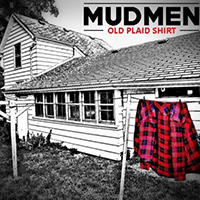 Jeannie McMaster and Mardie Plomp were guests on the CKDR Morning Show Friday to announce that all proceeds from the Mudman concert will support their 'Shelter Box' program. 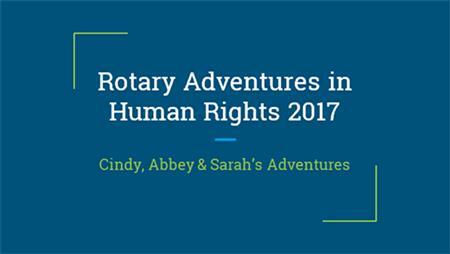 Two Dryden High School students, Abbey Taylor and Sarah Becker were the first Dryden students to take part in a new Rotary District 5550 program called “Rotary Adventures in Human Rights” (RAHR). During a new members’ first few months, they are required to provide club members with a brief account of their life and work. 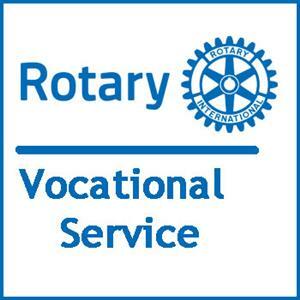 Here are a couple of excerpts from the vocational speech by Rotarian Leanna Bullock. This is the first in a series of interviews paying tribute to long serving Rotarians. 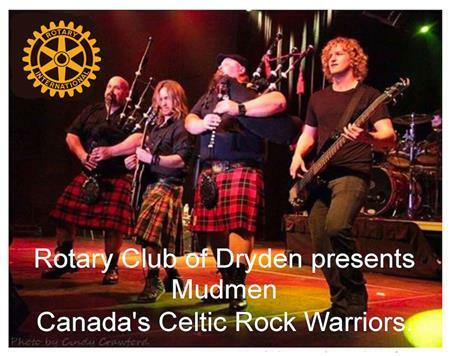 Rotary Club of Dryden presents Mudmen – Canada’s Rock Warriors fundraising in support of Hurricane Relief through Shelter Box. 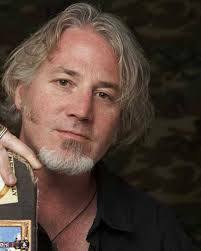 Club Rotarian, John Borst has arranged for the Canadian singer Jon Brooks to appear at The Midtown Stage on the evening of November 9, 2017, as he tours Western Canada. Varja LindstrÖm gave us a little insight as to who she is, her family and where she was from. Varja means “Wolf”. William (Bill) Beatty, age 90 years, passed away surrounded by his family on September 19thafter a long battle with Pulmonary Fibrosis. A Memorial Funeral service to celebrate Bill’s life will be held Monday, September 25th at 11:00 a.m. in the First United Church with Rev. Erin McIntyre and Alice Bloomfield officiating. 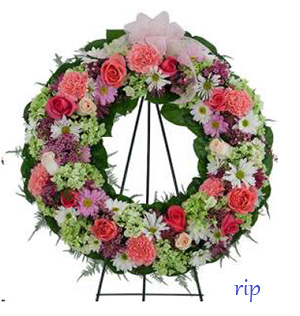 Interment will follow in the Dryden Cemetery. On September 9, 2017, nineteen Rotarians and friends volunteered their time helping the City of Dryden with its Household Hazardous Waste Day event. Varja Lindström gave us a little insight as to who she is, her family and where she lives. Varja means “Wolf”. 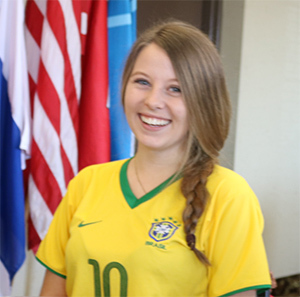 Dryden High School student, Sarah Wood, during 2016-17 did a year long Rotary sponsored student exchange in João Pessoa, the capital of the state of Paraíba in Brazil. 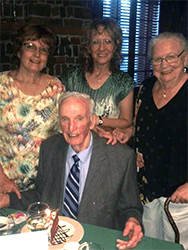 Rotarians Rena Madden, Joanne Misner and Joanne Bunney took former Rotarian Bill Beatty out to The Lodge for his 90th birthday. 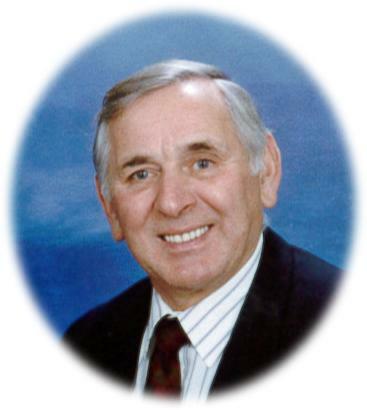 Bill served as club president in 1987-88. Club Rotarian, John Borst provided a brief updated vocational as part of President Ed’s "Spotlight" Program. 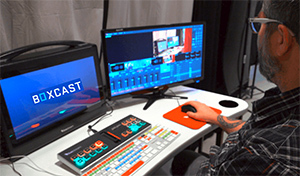 Although the idea was to speak for only 3 minutes, in the absence of the planned speaker, Borst was encouraged by the chair, to speak a little longer. “The finish line is in sight!” says R.I., V.P. Jennifer Jones in this TED Talk – PurdueU video. Watch this 15 minute talk to learn how Rotary got into the business of the eradication of polio, the sheer magnitude of organizational effort required to save millions of lives, and how threats and violence have been responded to by those doing the immunization in the three countries that remain. 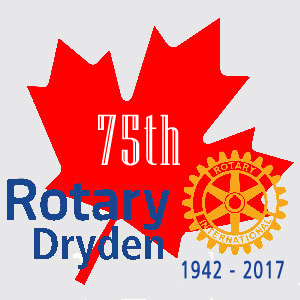 Approximately 100 Rotarians and guests converged on The Centre in Dryden on April 22nd for the celebration of 75 years of Rotary in Dryden. The quality of any community is measured by the educational opportunities available to its citizens. 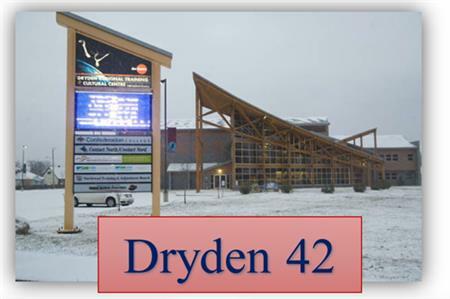 Forty-two years ago Dryden became the second Northwestern Ontario community to establish a satellite campus of Thunder Bay’s Confederation College which had been established just eight years earlier. 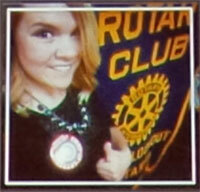 April 19th saw the induction of two new Dryden Rotarians: Leanna Bullock and Lee Ann Benson. 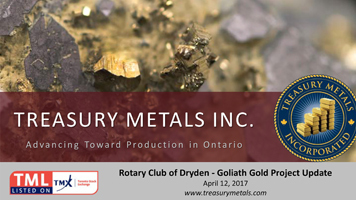 2020 is the year the Treasury Metals Gold and Silver mine is projected to go into production mine Vice-President Norm Bush told the Dryden Rotary club at the April 12th meeting. 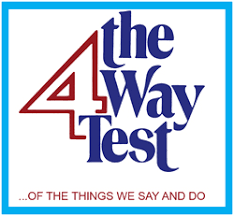 Of the Four Questions in the 4-Way Test which is most important and why? Last week I asked my Rotary newsletter members this intriguing question. The answers I received were very interesting, particularly since everyone seemed to have a very passionate opinion about why "of course it HAS to be Question X!" Guest speaker Roy Napish, shared an oral history of his culture, comments on the role of treaties and his experience with residential schools. 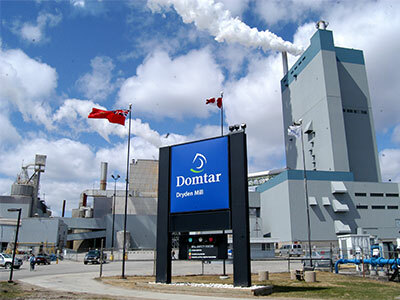 Jim Blight, General Manager of local Domtar mill, provided the club with an overview of the current Domtar operations and their future plans to transition to local operations. 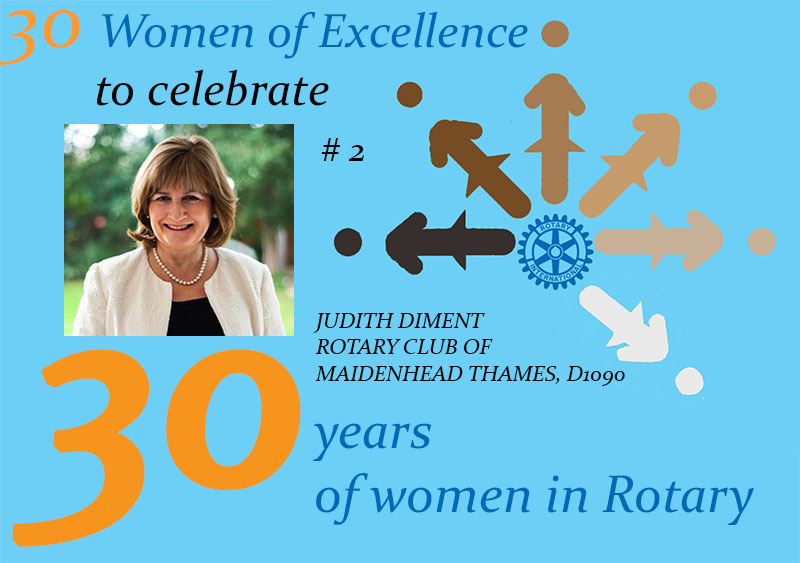 Clare Thompson, the Club’s only Past District Governor, shared interesting and humourous insights on the history of Dryden Rotary over the past 40 years ago. 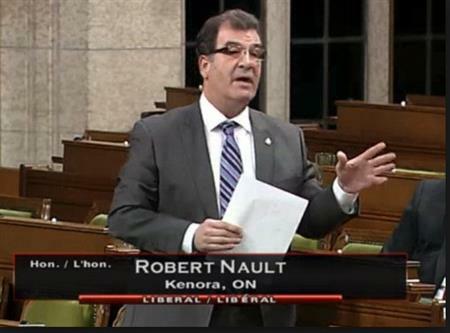 MP Robert Nault was here to bring us an update on activities in Ottawa, but first he wished the Rotary club a Happy 75th birthday and then mentioned Canada’s 150th anniversary. It was the club’s first spaghetti dinner evening. Rtn. Chuck Schmitt presented a preview of the next fundraising drive at the hospital for a new CT Scanner as well as an update at the hospital’s hirings. 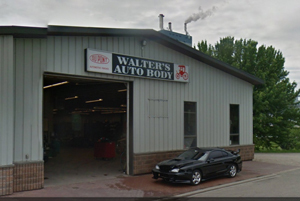 Walter’s Auto Body donates $1000.00 in Memory of Walter Denzler the Company’s Founder. Rtn. Joanne Bunny presented President Carl Eisner with a $1000.00 donation from Walter’s Auto Body in memory of past Rotarian Walter Denzler, the founder of Walter’s Auto Body. Rotarian “Carm” Fyfe as her “vocational” talk shared her family history with the club on February 8th. 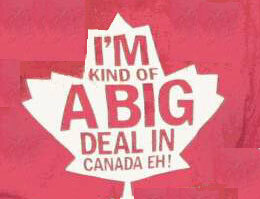 Carmela was born in Italy and came over to Canada with her parents and three sisters. 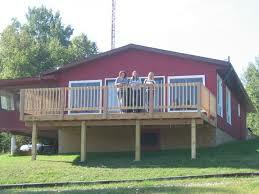 They first settled in Molson MB. 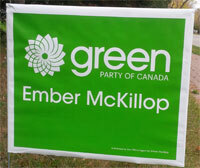 One was later born in Ontario after her father transferred to Wabigoon. 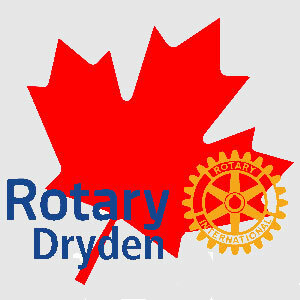 Everyone is invited to a Rotary Spaghetti Dinner Fundraiser to be held from 5:00 pm to 7:00 pm on Saturday, February 11th, 2017 at the Dryden Regional Cultural and Training Centre. For $20.00 you can experience Carm's delicious home-made pasta dinner, plus salad, garlic bread, and dessert. 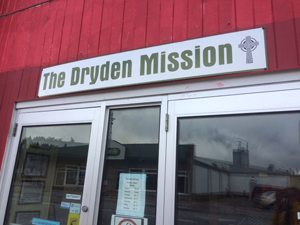 Jim Shearer of the Dryden Mission brought us an update on the progress of his “mission”. He last presented in 2012. The Mission is now a registered charity existing to help families and individuals find a relationship with Jesus Christ through “Serving One Another with Love". Wednesday’s guest speaker was Tom Ball of MAG Logistics. Ball provided background on MAG Logistics’ September 8, 2016, agreement with Discovery Air to buy DA’s Fire Services business. Final details and regulatory filings are expected shortly to finalize the deal. Mardi Plomp is now a regional Information Referral Coordinator with the Ministry of Attorney General who helps people experiencing a family break-up access the right information they need. 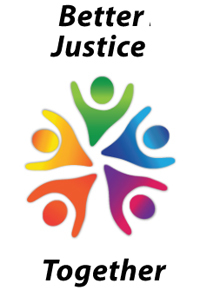 Her new job is part of a “Better Justice Together” program put out by the Ministry of Attorney General to ensure that access to the court system is cheaper, easier to navigate, faster and brings an integrated feel to it allowing justice partners to share and access information. Jakeob Gouliquer and Devon Carr, the 2016 Adventures in Agriculture students from DHS reported on their involvement in Adventures in Agriculture Program, November 23 - 27, 2016 in Regina. Their PowerPoint provided pictures of equipment - the first being a John Deere tractor that costs about $850,000. 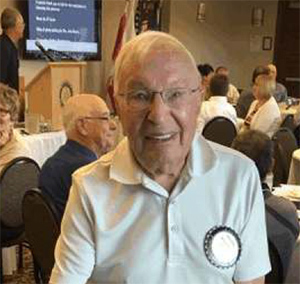 Rotarian since 1969, Walter Denzler, passes away. For our final meeting of 2016, Dryden Rotarians visited Princess Court to share lunch with Rtn. Walter Denzler who has been a Rotarian since October 24th 1969 and retired this month. 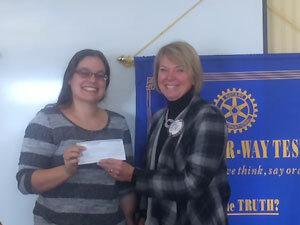 Rotarian, Kim Anderson-Fuerst, the club’s organizer of our contribution to the Dryden Meals on Wheels (MOW) program. 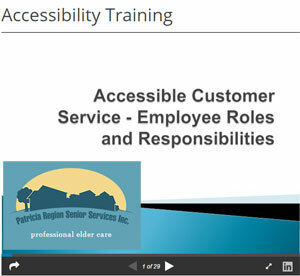 Kim brought us up-to-date on the programs growing need as well as refreshed our memories on the way the program is delivered. Rtns Jeannie and Jack McMaster provided an update on the Tri-Club northern literacy project. The three Rotary clubs in Northwestern Ontario namely Dryden, Kenora and Sioux Lookout have agreed to jointly fund a literacy initiative to provide books to the school at Sandy Lake First Nation. At the Nov. 30th meeting Rtn. 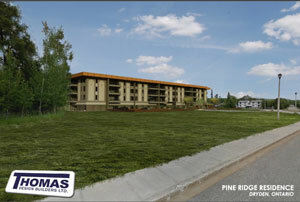 Mel Fisher provided an update on the 22 unit Pine Ridge Seniors housing project planned for the lot across from 330 Van Horne. For the first time in many years, Dryden Rotary’s Performing Arts Evening was not held at The Centre, Dryden’s performing arts venue. 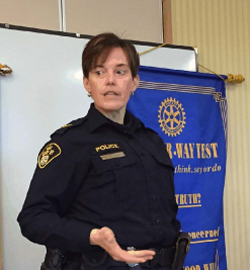 Michelle Teeple of the OPP startled Dryden Rotary with some eye-opening statistics on drinking and driving in the Dryden area. Teeple, a police officer for 23 years, thought drinking and driving by young people was on the decrease until she went into liquor store last May and found it almost bare so asked an employee why? After a preliminary outline of the origins of Remembrance Day, Rtn. Will Vermeer gave us an indoor “Spirit Walk”, that is a story about a veteran buried in the Dryden cemetery. In 1992 a group of far sighted Rotarians saw the need for members of Rotary clubs to better train future leaders. In that year a grassroots coalition of Rotary districts implementing a leadership development program for "potential" leaders of Rotary clubs. 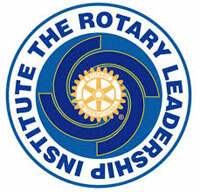 It is called the Rotary Leadership Institute of RLI for short. 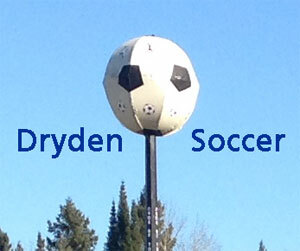 Dryden Soccer Fields at Rotary Park receive NOHFC grant for multi-use complex. 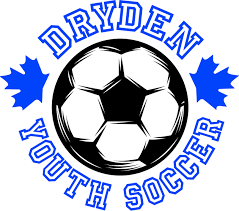 On Tuesday, November 8th, 2016 MPP Bill Mauro, Ontario’s Minister of Municipal Affairs, was in Dryden to present a cheque from the Northern Ontario Heritage Fund Corporation (NOHFC) for $124,000.00 to Gary Nichol of the Dryden Soccer Association. Dressed in a black burqa under a blazing sun with temperatures topping 100 degrees, Hina is going from house to house, knocking on doors. Plastered against the walls of the mud-brick homes, neat rows of hand-patted dung cakes dry in the sun to be used for cooking fuel. Open sewers stagnate beside the uneven dirt roads where children play. Henry Wall, our guest speaker and CAO of the Kenora District Services Board spoke on the mandate of the Board (KDSB). 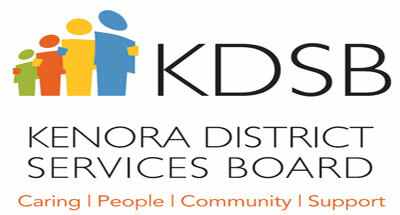 Wall began with a brief history of KDSB and its origins in the District Social Services Administration Boards Act of 1998. Its mission is “Dedicated to Improving Lives”. Back in 1956, the Rotary International Board of Directors designated a week in November ­urging all clubs “to devote a programme to The Rotary Foundation.” In 1982, the Board determined that the entire month of November should be dedicated to the Foundation. The second 2016–17 RI Board of Directors meeting was held from 19–22 September, 2016. At this meeting the Board reviewed 12 committee reports and recorded 64 decisions. 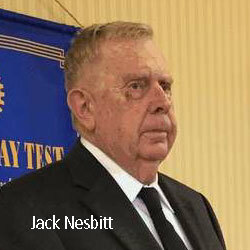 The guest speaker at the October 26th meeting was Jack Nesbitt of the Dryden Go-Getters. 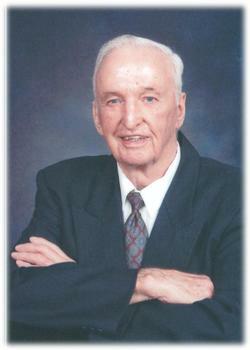 Jack, a retired teacher of 34 years, is a former resident of the City of Dryden who left in 1959 and returned in 2014. 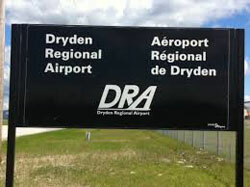 Norman Sanders, manager of the Dryden Regional Airport (DRA) spoke to the club about the future of our municipal airport. 2016-17 Exchange Student, Katarina Närhinen, shares her story with club. Katarina began her talk by telling us a little about her home country Finland. 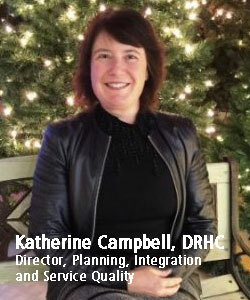 Katherine Campbell, Director, Planning, Integration and Service Quality at the Dryden Regional Health Centre (DRHC) introduced three medical students from the Northern Ontario School of Medicine (NOSM) Virginia McEwan, Krista Dowhos, and Lauren Turner. All three are third-year students and provided the club with a background story on their journey on the road to becoming a doctor. Although all are our speakers are women about 40 percent of the NOSM students are men. 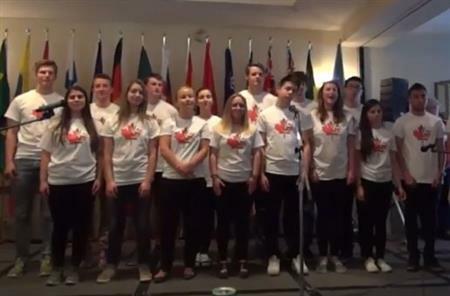 Rotary Youth Leadership Awards (RYLA) students, Mitch Turcotte, Sarah Urquhart, Jenna Stuart, and Jailla Stuart of Dryden shared videos they made at this year’s RYLA camp. At its 2016 Business Excellence Awards gala on September 17th, members of the local Chamber of Commerce voted to award the Rotary Club of Dryden its "Business Celebrating Youth" award for its support of area youth projects. Dryden Rotarian, Brian Kenny is part of a study at McMaster University on the effects of aging. 2016-17 District Governor (DG), Rod Riopel has been a Rotarian since 1996. 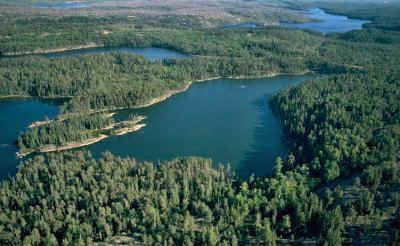 Besides having been President of the Kenora Club he has held other positions in the club as well. Amarok Society Introduces Club to Rahima, a mother sponsored by the Dryden Club. We are really pleased to introduce you to Rahima, the mother/student you are sponsoring! Local artist, Willene Moffatt spoke to Rotary about her work as an artist. 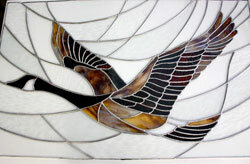 Moffatt has gone through various forms of art from pottery to painting and is now working mostly with stained glass. Dryden's new police chief Doug Palson was our feature speaker at our June 8th meeting. Chief Palson was raised in the Interlake area in Manitoba, is of Metis descent, and is a graduate of the University of Manitoba and Brandon University. Sandra gave us a wonderful oral and pictorial history of her time in Canada. Her presentation alternated between showing PowerPoint pictures and telling stories of her experience. Sarah Campbell our MPP was here to describe the challenges and rewards of being a provincial member of parliament. 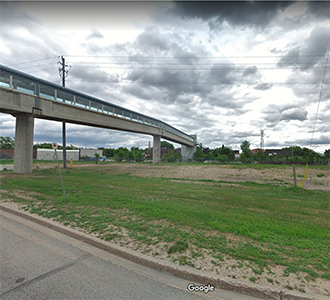 One such reward is seeing one of your private member’s Bill passed such as her most recent an item on tracking progress on the twinning of Highway 17 between Kenora and the Manitoba border. 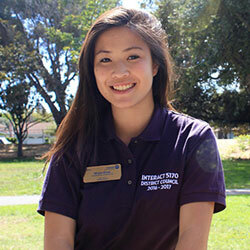 Deanna Pacheco does ‘vocational talk’ with little notice. Deanna Pacheco stepped forward to do her vocational talk when the meeting room was switched to the lounge. A vocational talk gives an opportunity for a new member to tell other club members a little about what you do for a living and a bit about your personal history. 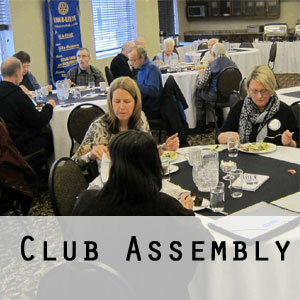 Guest speakers for May 11th were Kim Vares and Chuck Schmitt from the Dryden Regional Health Centre (DRHC) who spoke on Transforming the Local Health Care System and the issue of raising funds for capital improvements. Gord LeMaistre and John Beringer of the Kenora Rotary club were present to provide an update and a brief history of the Ripple Effect Program (REP) and our club’s involvement. The Ripple Effect Program is committed to creating a rich learning environment, with sustainable schools and the hope for a brighter future for children in Guatemala. 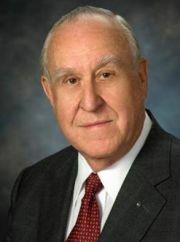 Each Year the Dryden Rotary Club celebrates the founding of Rotary International by remembering its founder Paul Harris. This year the 111th Anniversary of Rotary was no exception as a formal dinner was held at The Centre. The highlight of the evening was the awarding of 7 Paul Harris Fellowships. 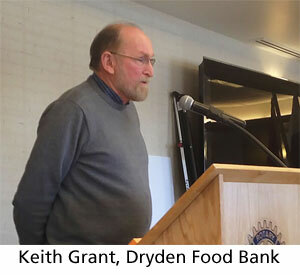 Keith Grant, manager of the Dryden Food Bank provided a brief history of the Food Bank starting from the early days when some of our local churches saw a need to help a few families that were having hard times at Christmas time during the late 1980s. The highlight of the March 30th meeting was the induction of our two newest members, Deanna Pacheco and Caryl Hron. Rotarian Will Vermeer conducted the ceremony after an introduction of the two members by their sponsor Rotarian Mardi Plomp. 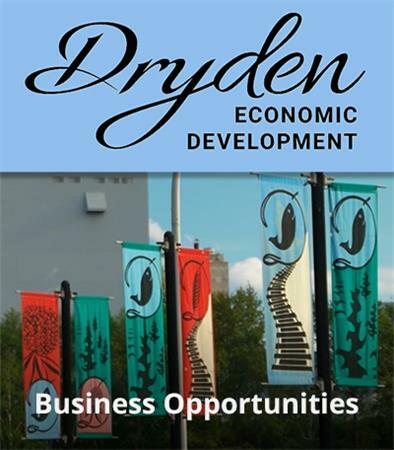 The need to pay attention to and attract more young people to consider a business career in the Dryden area was identified by the DDDC in a 2014.survey of Dryden and area businesses. Guest speaker, Joan Schneider’s dive into the quilting business was much like not being able to swim when all of a sudden you are thrust into the water and have to learn in a hurry. Her delve into quilting began when she and her husband were driving by the vacant Oxdrift Public School when her husband casually said they should “buy it”. 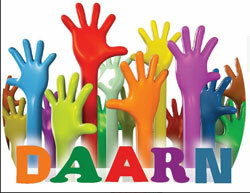 At its meeting on March 16, 2016 The Dryden Rotary Club presented a cheque to the Dryden Area Anti-Racism Network (DAARN). The cheque was in the $2,500 to continue to improve race relations in Dryden and the surrounding area. Ziggy Beardy, project officer with the Sioux Lookout Area Aboriginal Management Board (SLAAMB http://www.slaamb.on.ca/profile ) shared with Dryden Rotary a short history of the L’ll Bands Hockey Tournament that is now held in Dryden for a week each February. 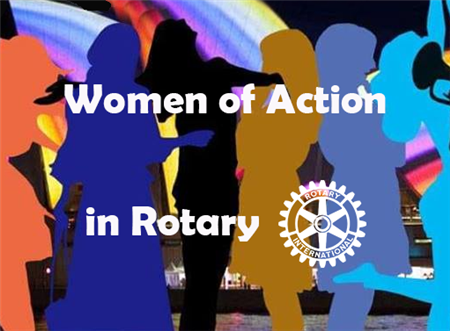 Our program for Wednesday March 9th featured Tammy Rollins speaking to Rotary on the Accessibility for Ontarians with Disabilities Act and how it applies to Patrician Gardens, its staff and volunteers. When you are the editor of a small town weekly newspaper, people what to know what kind of guy or woman you are. 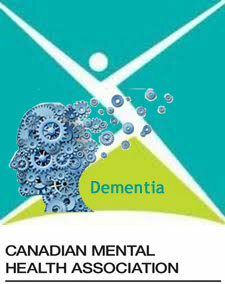 Monique Watford and Lori Russell of the Canadian Mental Health Association (CMHA) and Susan Traini of the Dryden Area Family Health (DAFH)Team spoke to Dryden, Rotary about dementia, and the importance of building a dementia-friendly community. Mayor Greg Wilson began his presentation with a portion of a report which had been requested by our Member of Parliament Bob Nault. The Trudeau Liberal government was looking for “shovel-ready” infrastructure projects. 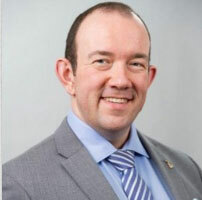 James Blasé, a Partner with, Business Development Bank of Canada (BDC) Consulting, and who serves clients across Manitoba and Northwest Ontario was our keynote speaker at the February 10th meeting of Dryden, Rotary. 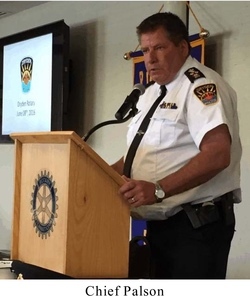 At the February 3rd Rotary luncheon, Gary Nickle gave the Rotary Club of Dryden a status update on the proposed change room facilities at the soccer fields in Rotary Park. 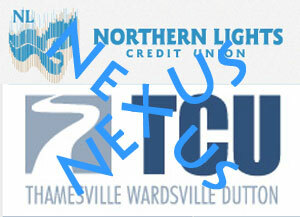 Ernie Remillard, a hometown boy who left Dryden and came back after many years in Southern Ontario to head up the Northern Lights Credit Union as CEO in 2012 shared with the club NLCU’s merger with the Thamesville Community Credit Union (TCU) and the formation of a new credit union to be called Nexus Community Credit Union. From time to time a club luncheon focuses on the business of the club rather than having a guest speaker. This is called an “Assembly”. The January 20th luncheon was such a meeting and was led by President Jack McMaster. 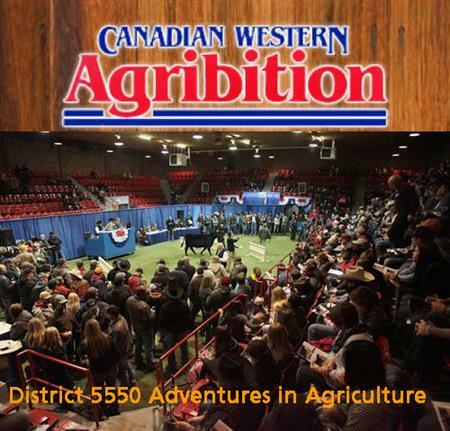 Adventures in Agriculture is a Big Deal in Western Canada, Eh! Izzy Harvey and Meghan Lovett were Dryden High School students visiting to tell us us bit about their time at Adventures in Agriculture, a program sponsored by the Club and District 5550. 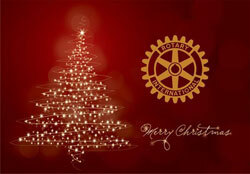 Dryden Rotary held its annual Christmas family dinner, this year, at the Centre. As often happens Santa made his appearance much to everyone's delight. The Dryden Syrian Refugee Committee was formed when Drydenite, Jerry Wilson contacted Dr. Ghada Ibrahim because she was the only person of the Muslim faith he knew in Dryden. 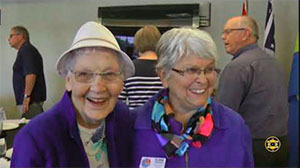 After talking her into chairing the committee and creating a loose connection with the Lutheran Church community and partnering with the Mennonite Central Committee they now have a designated family to sponsor. 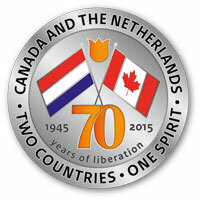 When the Canadian army liberated the Netherlands in 1945, they found the country on the brink of starvation. 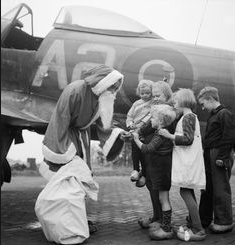 Seeing the suffering of so many, and especially moved by the faces of the children, four Canadian privates stationed near Apeldoorn that year decided to make that Christmas special for as many Dutch children as they could. 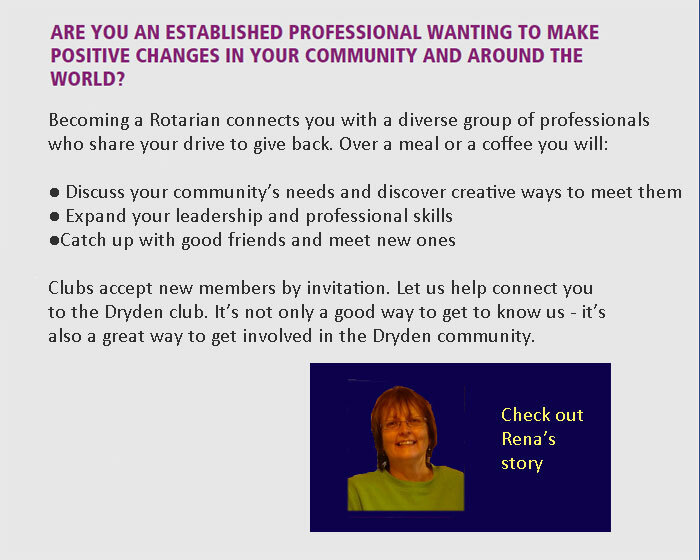 Asked to join The Rotary Club of Dryden in 2000 by a Rotarian member whom I respected as an individual, I had limited knowledge of the service organization. My children were young and we were involved with a business which demanded much of my time. Perhaps because of these demands; and not being born and raised in this community with a wide circle of friends, prompted me to attend a meeting and expand ‘me’ as an individual. My subsequent joining of the organization and volunteering also impacted our children in a positive way through their own volunteer efforts at Habitat for Humanity and animal shelters. With the help of the Rotary Club of Dryden, Dryden seniors are close to achieving the first new modern apartment complex in over 35 years. The meetings speaker, our own Rotarian Mel Fisher, had been involved in an earlier attempt to develop a co-op complex under a “life-lease” concept, a form of seniors’ development popular in Manitoba. 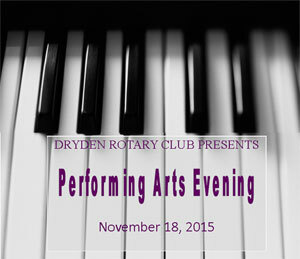 2015's Dryden Rotary Performing Arts evening added more speakers and piano winners for the audience to listen to, with the result that over 70 Drydenites attended the dinner and performance of our community's youth. Do You Want to Share Your Skills and Experiences With Others? 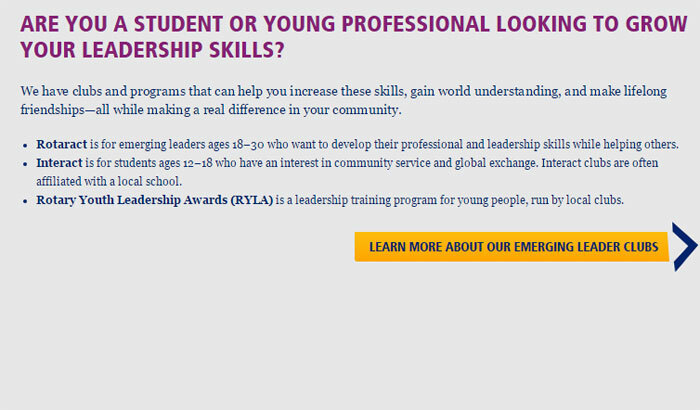 Are You a Young Person looking to Grow Leadership Skills? 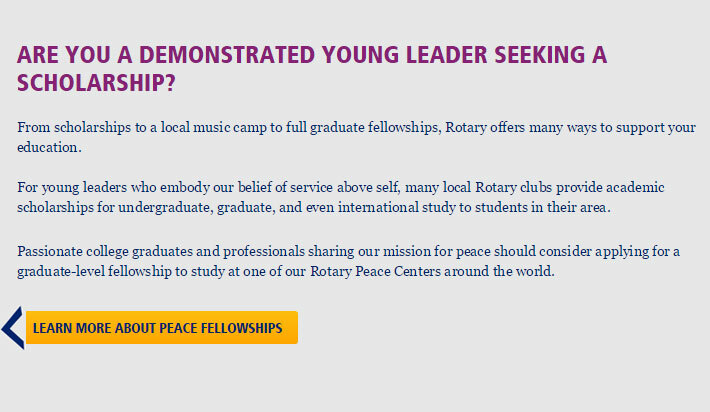 Are You a Young Leader Seeking a Scholarship? 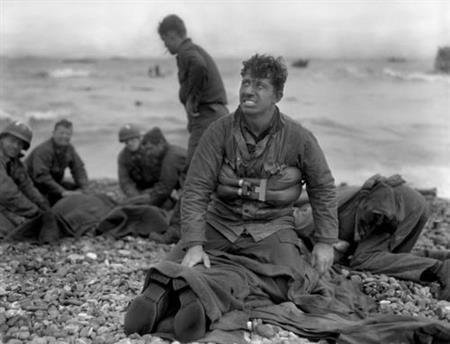 Rtn Roland (Rolly) Swan was a 13 year old boy when the Germans occupied his country of birth, Holland. As a Remembrance Day tribute Swan shared some memories of what it was like to live in Holland, during the World War II years. 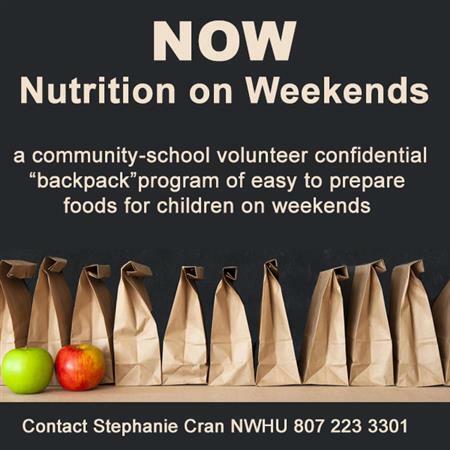 Do You Want to Make a Positive Change in Our Community and the World? 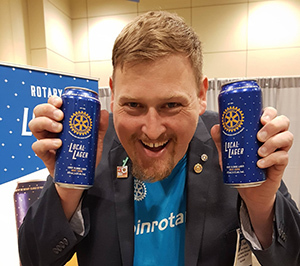 Rotary brings together people who want to use their skills, experiences, and expertise to solve some of the world's most pressing problems — from organizing local initiatives like helping to fund new equipment at the hospital, working hazardous waste recycle day, or youth scholarships to global efforts like eradicating polio. It all begins at the weekly club meeting, where members catch up with friends, hear what's happening in their community, and organize club activities and service projects. It's a fun way to connect with the people in your community who share your passion for doing good. 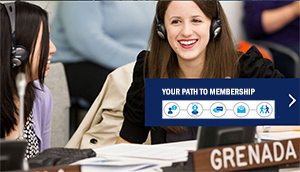 Learn more about the membership process and member responsibilities. Still have questions? Write to the membership chair. 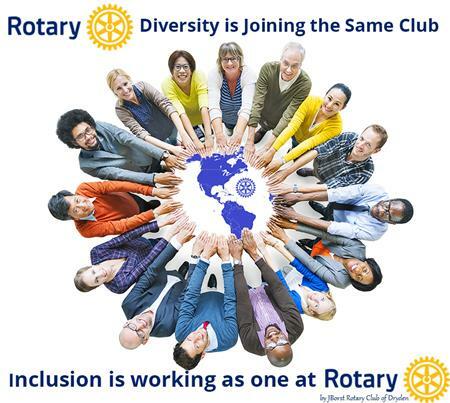 Rotary boasts over 1.2 million members in more than 34,000 clubs worldwide. 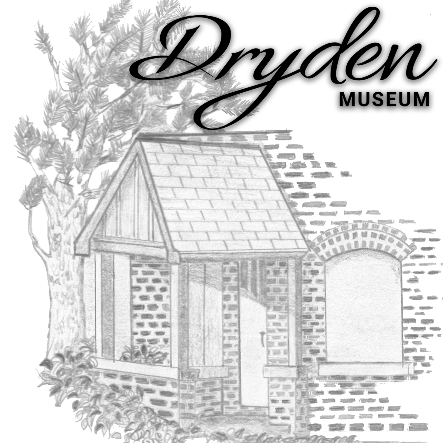 The Dryden club has about 55 members. 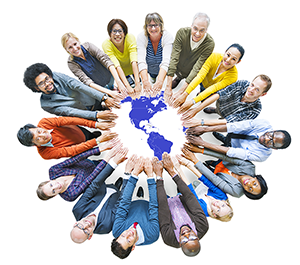 In nearly every corner of the world, you'll find a Rotary member who puts our motto, Service Above Self, into practice to make the world a better place. Pat Ridgey organizes our weekly Rotary Radio Bingo program which raises over $100,000 annually for local charities. Jill VanWalleghem, a local MNR biologist, spoke to Rotary on the growing presence of “invasive species” within the lakes around Dryden. Local entrepreneur, Kailey Divers, former owner of the Flower Forest shared the story of her new business “Canadian Pure Wild Rice” with Dryden Rotarians. She established the firm in 2008. On October 21, 2015 Dryden Rotarians enjoyed a vocational tour at Solomon’s courtesy of Rtn Roger Gould. 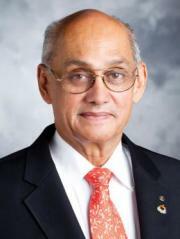 Wilmer (Willie) Cheslock became a Rotarian on January 1, 1998, having been proposed by Rtn Larry Neely. He passed away unexpectedly October 19, 2015 of a type A aortic dissection or “tear” in his aorta. Ember McKillop of the Green Party of Canada was the fourth and final candidate in this Federal election to speak to the Dryden Rotary club members. Using a slide presentation, she said that the Green Party is "not just about the environment" and then went on to describe in some detail their full Party platform. 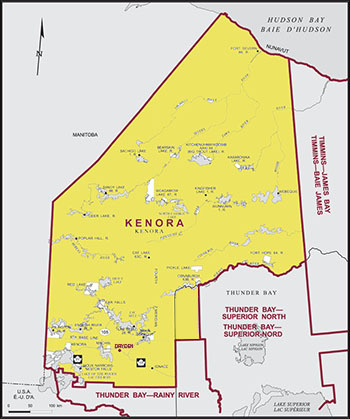 The Kenora Riding’s third candidate to speak to Dryden’s Rotarians is Howard Hampton, former leader the New Democratic Party (NDP) in Ontario. Greg Rickford, our local Conservative candidate in the upcoming Federal election, provided us with a brief history of his record over the last 4 years. For the third consecutive year Dryden residents have taken the opportunity to dispose of their hazardous waste in a safe and secure manner. 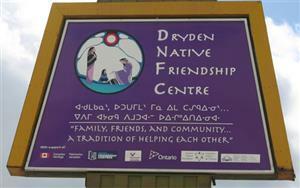 The September 9th meeting was held at the Dryden Native Friendship Centre (DNFC) where DNFC Executive Director, Sally Ledger provided us with a brief report on the result of their first strategic plan and an overview of their new 2015-2020 plan. 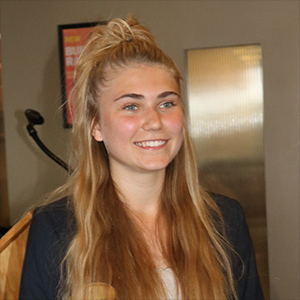 Dryden’s Rotary Exchange Student for 2015-2016 is Sandra Hrášková. She arrived in Dryden on August 23rd, after flights from Vienna to Toronto and Toronto-Winnipeg. I interviewed her before the meeting on September 2nd. Dryden Rotary’s September 2nd meeting had the entire 2015-2016 Ice Dogs team plus their Director of Hockey Operations, President, Coach and Public Relations volunteer present. Each spoke briefly to the club. Emma McDonald is a young Rotarian, currently residing in Sioux Lookout who told Dryden Rotarian, Carl Eisner her story while he was visiting that city. He invited her to share her story with the Dryden club. 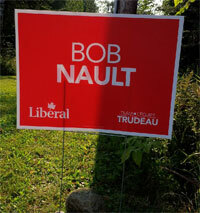 Liberal Party of Canada candidate, Bob Nault was the first candidate of the Kenora Riding to speak to Dryden Rotary about his platform in this the October 2015 election. 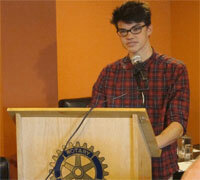 Logan Waller gave us a brief history of his time in Denmark as a Rotary Youth Exchange student. Waller left Canada on August 10, 2014 and returned June 30, 2015. 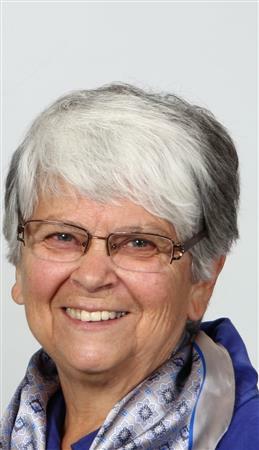 Sheryl Hoshizaki, a retired educator having been a teacher and principal also served as President of the Women Teachers Federation of Ontario. Once in their younger days, she even threw our President, Jack McMaster over the judo floor. 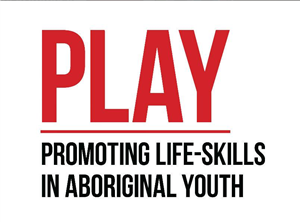 After retirement from education, Hoshizaki joined Right To Play, where she served as Deputy Director of Educational and Aboriginal Initiatives. Past President Brian Braid attended the 5550 District Rotary Conference in Nipawin, a 12 hour ride from Dryden. 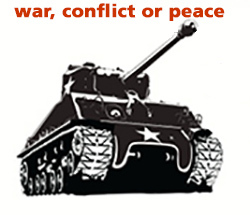 Keynote speakers were Mel Duncan and Ann Frisch who talked about a “non violent peaceforce” hoping to transform the world’s response to conflict. 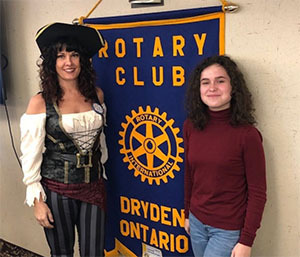 Dryden’s Carly Brown has several connections to the Dryden Rotary Club. She operates Lokah Sangha Yoga, providing an original style yoga instruction in a facility next door to the Masala Restaurant where the club meets weekly. Outgoing President Brian Braid ends a successful year as head of Dryden Rotary. 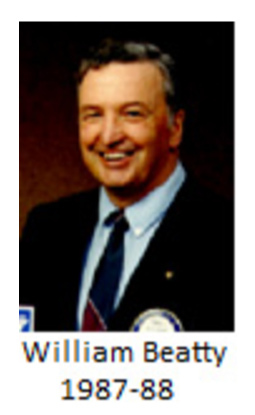 During his tenure Dryden Rotary reached the one million dollar mark in donations with well over $100,000.00 in the past year. Sean Wood is a Grade 11 student at DHS, son of Mike and Kate Wood and is Dryden’s newest outgoing Rotary exchange student. At Wednesday’s meeting Alba Posas Solandes reflected back on her year in Canada while we got to celebrate her recent birthday. Chuck Schmitt, Recruitment and Fundraising Coordinator for the DRHC and Dr. Adam Moir were on hand to receive a cheque for $30,000 for the hospital’s foundation. Under the leadership of Rtn. Natasha Lovenuk-Markham The Rotary Club of Dryden has been reviewing its 2012 - 2015 Strategic Plan. 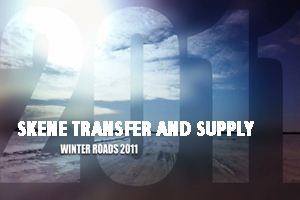 Please review the draft 2015 - 2018 documents and make further suggests by June 1st. Rotarian Natasha Lovenuk-Markham introduced this year’s four MUNA students: Isabelle Keefe, David Marshall, and Regan Neall, all in attendance, plus Alyssa Deschene who was not able to attend. After a brief presentation on the role of the Amateur Radio Society of Dryden (ARSD) Dave Wessell and Bob Ernewein provided a description of their efforts to acquire a 16 foot Mobile Communications Trailer. Dryden Rotarian Sally Sipos says Habitat for Humanity’s Global Village trip to build a house for a family in a developing country can be a “life changing experience”. Sally has been on 5 builds and will lead one in May of this year. 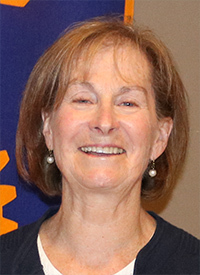 Rotary District 5550 has assigned Sandra Hrášková of Bernolakovo near Bratislava, Slovakia to the Dryden Club as its 2015-2016 Rotary Exchange student. This is the first time Dryden has had an exchange student from an East European country. 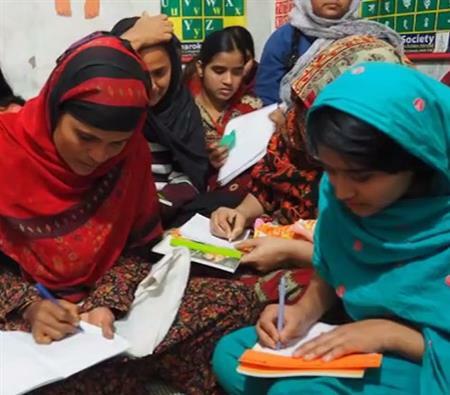 After over eighteen months of work, it seems only fitting that Dryden Rotary’s participation in a Basic Education and Literacy Global Grant Request be submitted to Rotary International during March which in Rotary is “Literacy” month. The film The Final Inch depicts the problems still occurring fifty years after the development of the polio vaccine. 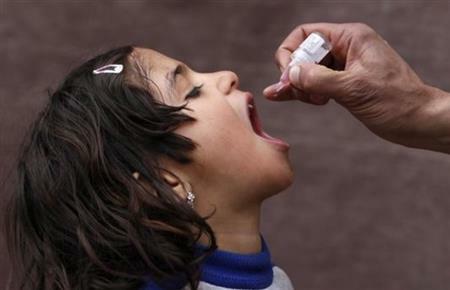 It describes areas and Countries where the polio virus is still found around the World. The Rotary Club of Dryden held their Paul Harris Fellowship Award Dinner on February 25 which honoured three community members and five members of the Rotary club for their commitment to volunteering and making a difference in Dryden. 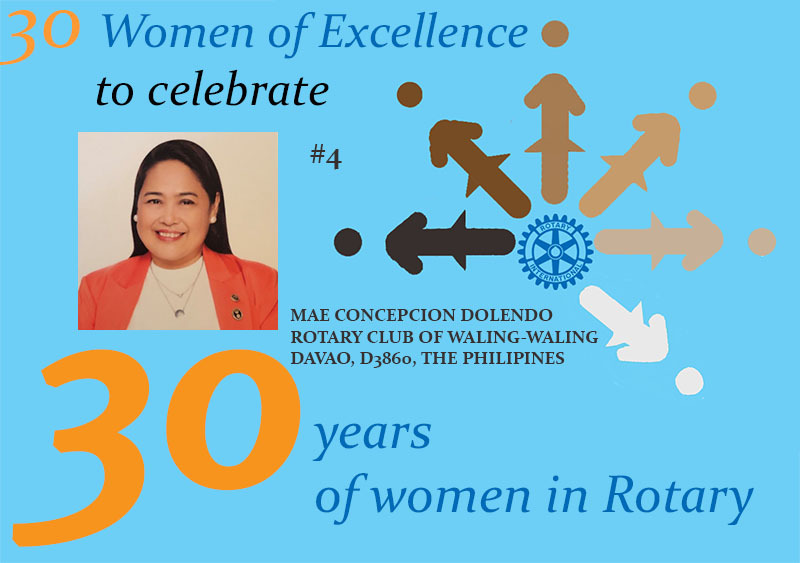 Each year Rotary International celebrates its founding on February 23rd. 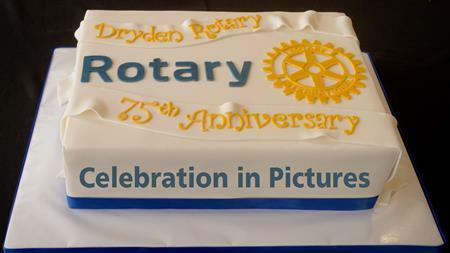 Locally, this year the Rotary Club of Dryden celebrated by holding a Rotary Day at Dryden High School (DHS). 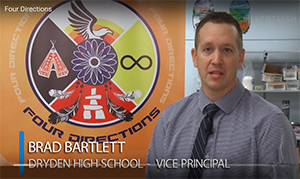 Kieran McMonagle, the Four Directions “Grad Coach” and Jennifer McMaster, DHS, vice-principal provided an update on the “Four Directions Program” which focuses on assisting First Nations and Metis students entry into high school. 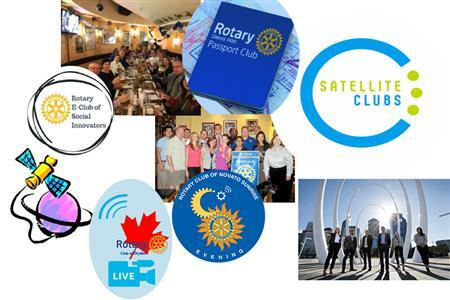 How to use Rotary International’s new website, the process we will use to renew the Club’s “strategic plan” and a variety of presentations have been the focus of meetings so far in 2015. 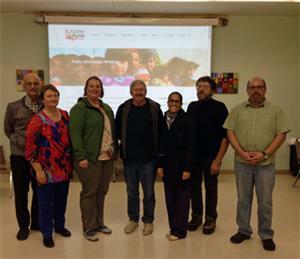 Jed Denham and Alexandra Cooper, attended our December 10th meeting and shared with us, their experiences at the Adventures in Agriculture Program from November 26 - 30, 2014 in Regina, Saskatchewan. Mike Wood, star Master’s Marathoner and former city councilor didn’t know the adventure he was about to embark upon when in 2009 he volunteered to rejuvenate the cross country and track and field club at Dryden High School. Did You Ever Wonder Who Looks at this Site? 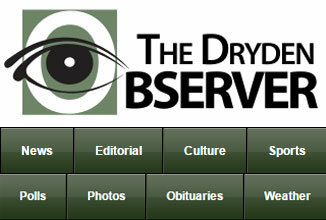 One of the counters supplying data on www.drydenrotary.org is Statscounter. 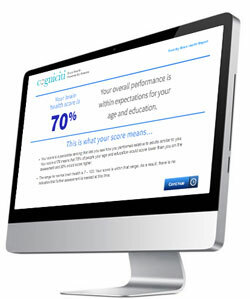 You can see the data for yourself by clicking on View My Stats at the bottom of this Home Page. However this story will provide a quick view of where people came from between Oct. 26 and Nov. 30, 2014. Each year the Dryden Rotary Club sponsors a public speaking contest and holds a special Performing Arts Dinner so the community can listen to the best of the year’s Grade 7 or 8 students. A number of Rotarians and guests enjoyed a sumptuous Spanish supper at the Vann-Eisener residence courtesy of Alba Posas Solandes (with a little texting to Mom in Spain) We all also learned a few Spanish words to try out over the next 6 months. GRACIAS Alba! 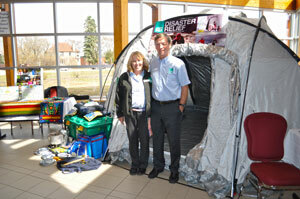 President Brian Braid with the assistance of Rtn. Jeannie McMaster, provided us with an overview of the International Service portfolio. 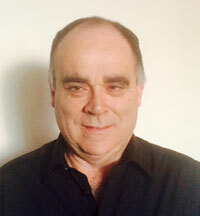 McMaster is the club director responsible for the International services portfolio. The aim of International service is to give assistance on a global basis whether be it of a physical or financial nature. It also involves local Rotarians learning from our global friends. Kim Vares , Director of Patient and Public Relations at Dryden Regional Health Centre (DRHC) spoke to Rotary on the topic of the formation of a Patient and Family Advisory Council. The Council is to be a Partnership of patients and family members and the healthcare team. Its purpose is to provide guidance on how to improve the patient and family experience. Vera Kameda-Lacroix was our Remembrance Day speaker giving us the history of her grandfather Kenneth Austin who served in both the first and second world wars. 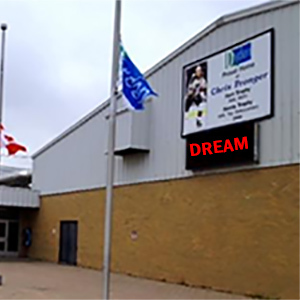 The following piece originally appeared in the Dryden Observer 2014 09 24 (page 4). 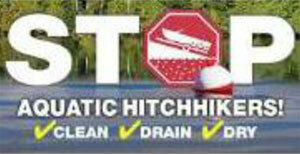 When you are out in a small, outboard fishing boat, you can steer the boat and operate the engine yourself, no problem. As your ship gets bigger, you need help. Having a community Hazardous Waste Day in successive years increases the number of participants and the volume of hazardous waste gathered rather than seeing a decrease in the second year. “That is the lesson to be learned from Dryden’s 2014 very successful Hazardous Waste Day.” says Rotary organizer Roger Gould. Rtn. Rena Madden, DRCF chair, with the assistance of other members of Dryden Rotary Charity Foundation (DRCF) executive provided a short history of the Foundation and its donations over the past 10 years. 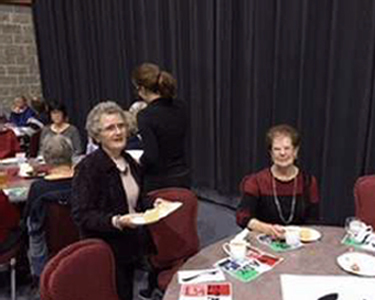 September 10th ‘s Rotary luncheon proved to be a busy one. New members to Rotary Clubs at some point do a talk on their life with a focus on their career. We call this, their “vocational” talk. Normally members give some thought to this and some are even a little anxious in the process. But not our new member Sally Sipos! Imagine being 16 and getting a change to spend a year of your life in a Swedish town famous for its ski hills, the Whistler or Vale of that country. 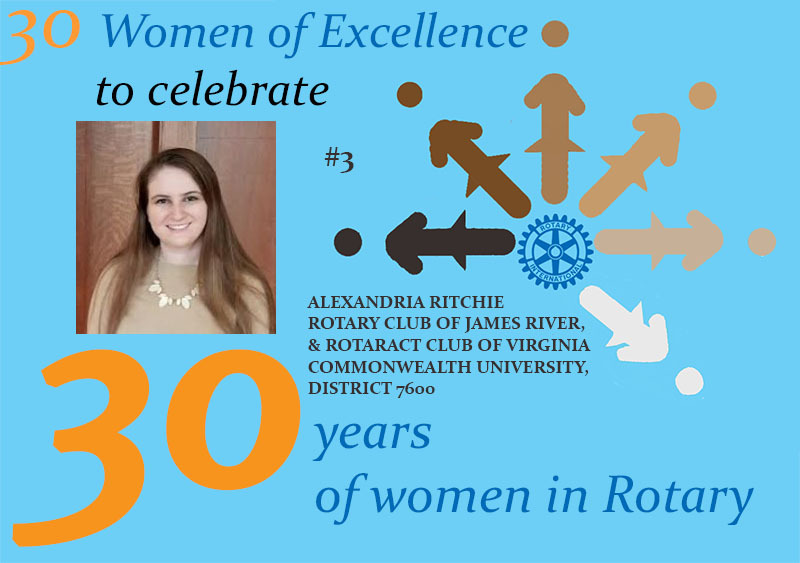 That is the opportunity Jessica Stuart had as a Rotary Exchange student. 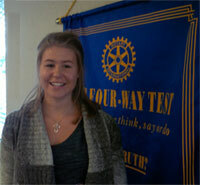 Tianna Markowski is a DHS student who was sponsored on the Rotary Youth Exchange by the Rotary Club of Sioux Lookout. 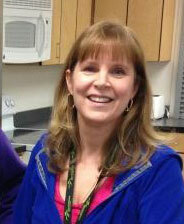 Jeannie McMaster’s career as a teacher and educator spans a 32 year period. 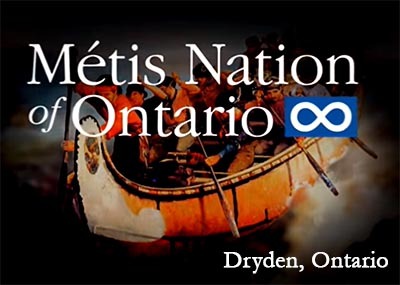 Beginning in 2014 Dryden High School is piloting a new program for First Nations, Metis & Inuit (FNMI) students. 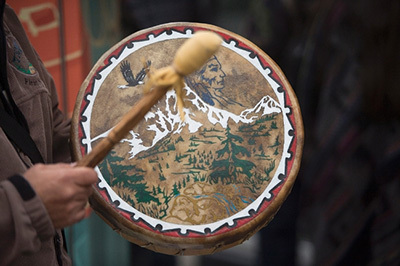 FNMI is a program which provides mentorship, individual and group support for First Nations, Metis, and Inuit students transitioning to and attending High School. 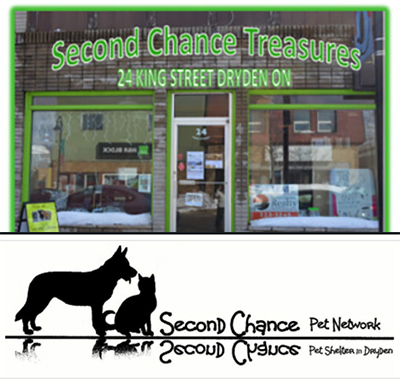 It is the first program of its kind in Ontario. Assistant Governor Rod Riopel of Kenora introduced our DG Pat Chernesky. Pat has been a physician for 40 years and lives in Nipawin, SK. 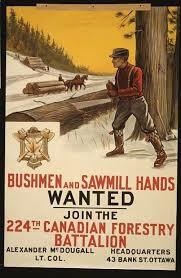 Carl Eisener was born in Chandler, Quebec in 1953 Interestingly, he and Rtn. Norm Bush crossed paths when he had been on this earth for about a week and Norm was about one year of age. Jen Springett is President of the Cloverbelt Local Food Co-op (CLFC) and has been a resident of Dryden for the past few years. Logan Waller has just completed Gr 11 at DHS and was selected as our Rotary Youth Exchange student for the 2014-2015 school year. 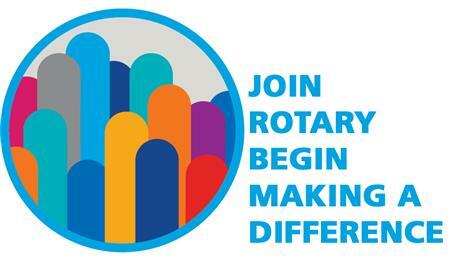 A Rotary year runs from July 1st to June 30th of each year. June therefore sees the installation of a new president and officers and the retirement of the outgoing president. For the past three years, Dryden Rotary’s annual installation has taken the form of a “Fish-fry” at the local flying club off Gordon Road. 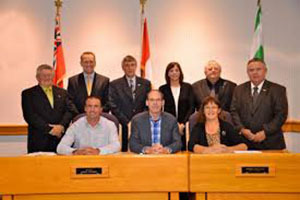 At its May 2014 meeting the Dryden Rotary Charity Foundation recommended to its membership the disbursement of $87,800 to a variety of local or regional causes. 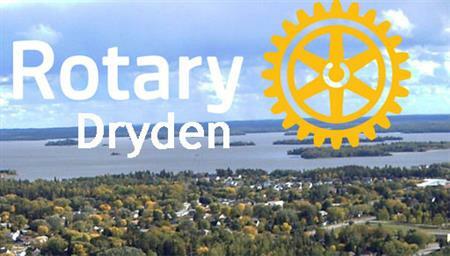 The May 28th meeting of the Rotary Club of Dryden witnessed the induction of five new members. This was the culmination of the first phase of the 100 day "Get Your 'Ask' in Gear" membership drive. Rotarian, Mardi Plomp introduced her 2014 Dream Believer team and then provided a brief the history of this now multi-year event. The idea of raising funds for cancer research began with Mardi's personal family experience with the disease. 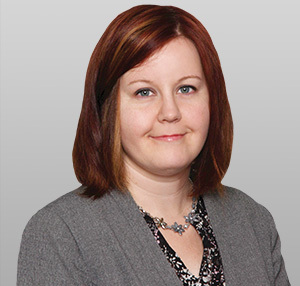 Gwen Kurz, Secretary-Manager at the Chamber of Commerce is presently leading a Business Retention and Expansion ( BR+E) program among Dryden area businesses. Bonjour ! Hi everyone ! 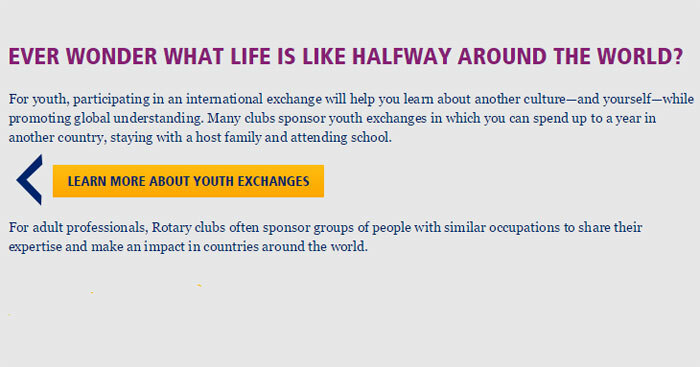 Since I had the best experience of my life as a Rotary exchange student in Dryden 4 years ago, I was looking for a way to get involved in Rotary. 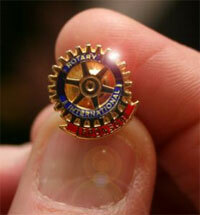 As I am too young to become a Rotarian, I became a Rotaractian !!! The Model United Nations Assembly is a learning simulation of the United Nations General Assembly in its structure and proceedings. Peter Hinz, Team Lead - Exploration and Mineral Development - Ring of Fire Secretariat had the full attention of Dryden Rotarians and their guests from City Council and the Dryden Economic Development Corporation as he described the development of the most important mineral find in Ontario’s history. Reverend Steven Paulson, who has served as Executive Director of Teen Challenge of Central Canada for over 20 years, was our feature speaker at the April 16, luncheon. 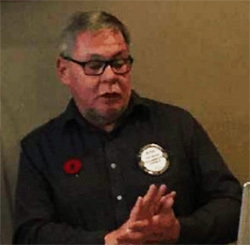 By the number of questions Rotarians had for guest speaker Doug Robertson from the Dryden Camera Club you would think they all wanted to improve their photography skills. Robertson provided an overview with a few choice slides about what the club is and what they do at their monthly meetings. Former Rtn Maryann Jost, the regional manager for Ontario Aboriginal Housing Services (OAHS) was Dryden Rotary’s feature speaker for our March 19th meeting. On Friday April 4th​, Dryden Rotarians are invited to join the Dryden Trillium Lions in an International day of friendship by joining them for lunch at the Dryden Legion from 11:00 A.M. TO 1:30 P.M.
Our speaker Dayna Debenedet came to us as chief librarian of the Dryden Public Library (DPL) from New Brunswick, however, she grew up in Fort Frances so is happy to be closer to family and friends. 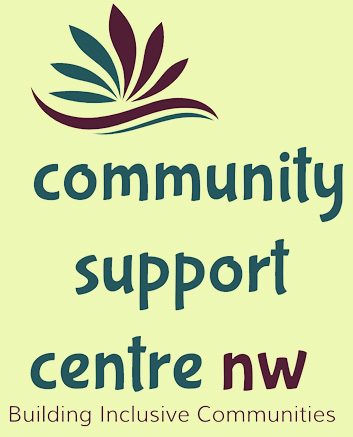 Following a brief introduction to the 5th Annual Rotary online auction by chair Marg Saville, members were asked to take letters requesting a donation to the community’s various businesses. These were distributed along with a form to gather particulars such as estimated value and donor contact information etc.